The Department of Seaports & Customs of the Government of Sharjah on Wednesday signed a sister port agreement with the Diamond State Port Corporation of the state of Delaware in the US to cooperate in the development of international trade and logistics, exchange information, and build mutually beneficial commercial, technological and cultural synergies. The agreement also enables private companies within the catchment area of the respective port authorities to collaborate on trade and investment prospects, according to a statement. “The agreement is a highly significant step in boosting economic ties between the UAE and the USA. We see this as a great opportunity to bolster the overall economy of Delaware through productive partnerships and the sharing of industry best practices,” said Jeffrey Bullock, Secretary of State of Delaware after signing the agreement at the Sharjah Chamber of Commerce. The signing took place following the official handover of the Delaware-based Port of Wilmington from the Diamond State Port Corporation to Gulftainer to operate and develop the port over a 50-year concession period. Sharjah based port operator Gulftainer plans to invest $580 million (Dh2.13 billion) in developing the cargo terminal capabilities of the Port of Wilmington to enhance its overall productivity with a new 1.2 million TEU (twenty-foot equivalent units) container facility worth approximately $410 million. The deal represents the largest investment ever by a private UAE company in the USA. “In line with Gulftainer’s commitment to generating cross-border socio-economic impact across the globe, this sister-port agreement facilitates strategic trade and knowledge exchange between the UAE and the USA, and further boosts bilateral relations between our countries,” said Badr Jafar, Chairman of Gulftainer’s executive board in a statement. In the US, Gulftainer currently operates the Canaveral Cargo Terminal in Port Canaveral in the state of Florida after winning a 35-year concession in 2015. Among other sectors, the company provides logistics services to the US space industry and all five branches of the US military. 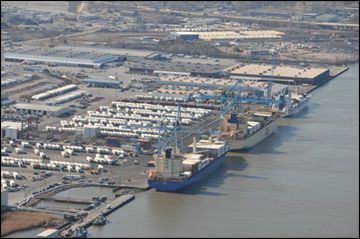 The Port of Wilmington is the top North American port for fresh fruit imports into the USA and has the largest dockside cold storage facility in the country. It began operations in 1923 as the first major port on the Delaware River.